Deer antlers are made of true bone that is fed by the covering of velvet. 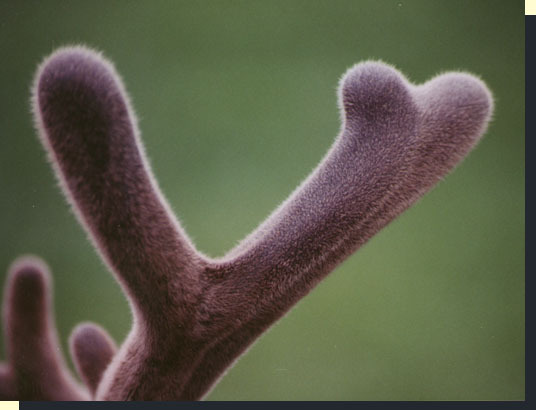 Antlers are made of true bone that is fed by blood which is carried in the outer velvet covering. Velvet antlers are hot to the touch, with brushy hair and a waxy feeling coating. Deer need both protein and minerals to grow their antlers. This is in contrast to horned animals whose horns are made of keratin (like fingernails), who do not shed, and who need only protein to grow their horns optimally. Appreciate too that whitetails must grow a new set of antlers every year, while animals who have horns only need to add gradually to their existing horns. This buck's antlers have quite a bit of growing to do as you can tell by the clublike tips. A buck in velvet is sensitive and extremely protective of his antlers. These bucks will not fight or spar with their antlers when still in velvet, and if provoked they will rise to strike with their just as deadly hooves instead. Watching a buck in velvet slipping through the woods, you will see him delicately turn to avoid brushing the branches with his antlers. scratch to his itchy, velvet antlers. A buck that is in hard horn knows it, and it makes him cocky. If a buck in hard horn sees a more dominant buck who has already shed his antlers, or has broken his antlers or who is still in velvet, the "fully armed" buck can take advantage and play the bully. The whitetail's antlers are not just for defense. The antlers are used for two other important purposes, both related to reproduction. One purpose is to advertise to females their good health, mature age and fitness as a mate. The other purpose is to use them as a grappling tool to engage in a test of status and breeding fitness against other bucks. Male rank is not usually determined by all out fighting. The bucks mainly spar to see who is the stronger contender, but they can also spar in a friendly way, for practice, even with a much smaller buck, or a young one; and if the large buck's rack is too large, he might offer the young buck just one of his antlers to lock onto. In the typical sparring match the bucks lock their antlers, twist their necks and push in circles, with each deer trying to throw the other off balance. This will show both bucks who is the fittest. A head-on death match can sometimes occur between two steamed up, equally matched opponents. Obviously though, if that was the usual way, the damage that they did to each other would not allow for much breeding because the bucks would be dead, dying or severely injured, and the winner of a match as much as the looser can go off to a slow death from his wounds. As it is, bucks suffer many injuries in the normal, "gentler" sparring contests of a breeding season, and that comes in addition to the other severe stresses they endure. 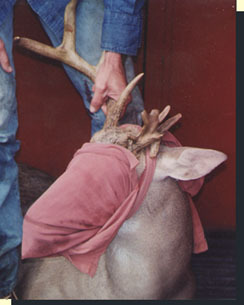 The buck has a cloth over his eyes because he was sedated, and--just like covering a horse's eyes during a fire will calm it and allow you to lead it to safety--blocking a deer's vision, either this way, or by darkening its surroundings, will similarly help in calming it. In the dark the prey animal's anxiety and flight responses are lessened dramatically. This means less stress and fewer injuries. A deer in a panic can easily kill the person handling him, and can easily kill himself. After rubbing off their velvet, over one day or a few days, bucks start to rub and play fight with trees and brush. 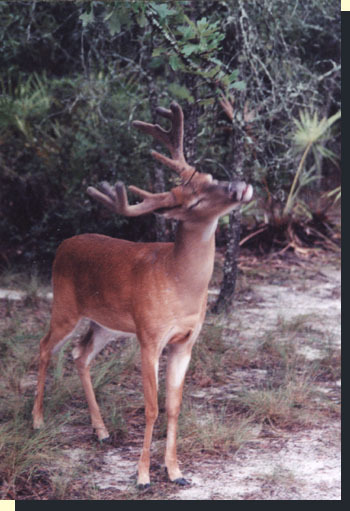 A buck can sometimes hang from a tree by his antlers if they get locked in the branches, but the boisterous buck in the end does manage to wriggle loose. You can easily spot the buck rubs as saplings with the bark rubbed off. If you see a sapling scraped to a height of eight or ten feet, don't assume that it was made by a giant deer...the long scar comes about by the buck bending the tree to the ground as he continues to rub. It is less common to see a deer rub on a thick, unbending tree. It is now that the rutting bucks also begin to make their scrapes. If you do not see a navigation bar on the left, you can click here to go HOME.